$16.96 on Amazon look inside this book! Mosaic & Lace Knits is an introduction to a technique that I have been developing over several years that brings colorwork into lace using slip stitches. 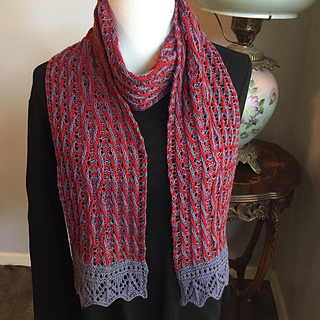 Handling only one strand of yarn at a time, no carrying along the row or stranding, allows development of colorwork patterns without any floats running behind your work and obscuring your lace. that looks like you did something difficult when in fact you did not. The scarf begins at one end and is knit until the colorwork is finished and you then transfer the stitches to waste yarn. A second bit of trim is cast on and worked and then you graft it onto the body of the scarf. If you would like to see this piece in action watch the video pattern tour on my YouTube channel Watch Barbara Knit. 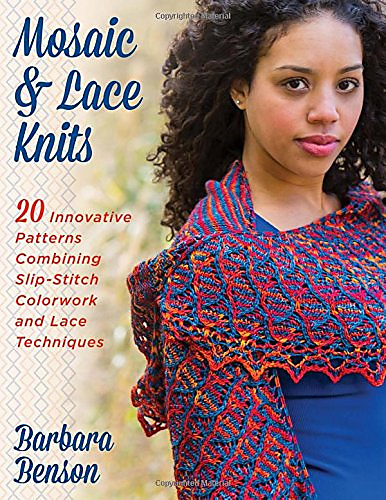 I knit two of the scarves in this book while on family trips and I named them after the trip. This one saw us traveling to Sarasota, FL where we spent a lot of time on the road Tamiami trail which runs from Tampa to Maimi. If you are ever in Sarasota make sure to visit A Good Yarn - I did a good bit of knitting in this lovely store.